Riders testing out the latest and greatest in Bootleg Canyon during the Interbike Outdoor Demo. 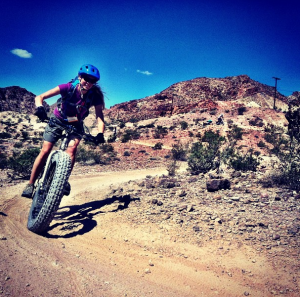 Adventure Journal’s Hilary Oliver shreds on a Surly Moonlander. 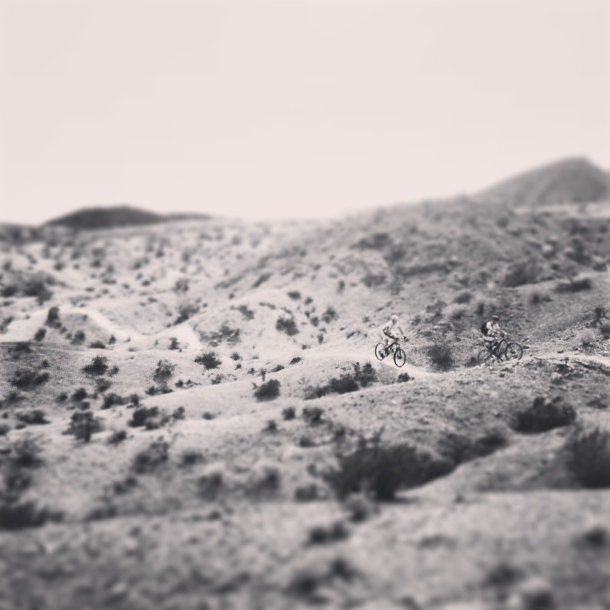 Bootleg Canyon has many fine features, but dirt is not among them. A thin layer of pea gravel on top of hard clay wouldn’t be so bad if it weren’t for the piles of jagged rocks on either side. This surface is does not respect tentative riding on unfamiliar bikes, as both Chip and Alex found out as they watched their front wheels slide away moments before hitting the ground. Fat bikes are so hot right now. From carbon rigs weighing less than 21 lbs. to the bombproof Surlys that are tried and tested, fat bikes were everywhere at Demo. We sampled a Surly Moonlander on the very moon-like terrain and were tempted to plant a flag and claim it for Utah. Fun fact about carbon mountain bike frames: It’s much less stressful to crash them when they aren’t yours. We samples the latest from Pivot (Mach 6), Devinci (Dixon) and Santa Cruz (Bronson), bounced them – and ourselves – off some rocks and returned them looking good as new. Carbon is burly. Ebikes are here to stay. After spending both mornings at the packed Currie Technologies booth we can confidently say that the U.S. market “gets it.” Look for a Bosch-equipped Haibike on a trail near you soon. Now we’re headed inside to represent the fine folks at Kinetic, Fix It Sticks and Currie. Look for the guys with scraped up elbows.